There are a number of 'scandalous' story lines in the news today, including Roger Clemens' session with congress and, closer to home, Detroit Mayor Kwame Kilpatrick's ongoing 'Text-gate' and secret deal investigation. Both of these have share common elements. Both involve extensive lying (opinions of who is doing the lying aren't relevant). And both are said to be "bad PR." PR has nothing to do with the stories at this point. The 'bad PR' happened when the lying took place, and the current state of these issues is the fall-out from that lying, and an attempt to cover it up. PR is about communicating and truth; the total opposite of covering up. You are your own personal PR machine every day. Ethics, style, relationships, integrity, values, and the company you keep - these make up your reputation over a lifetime. Same goes for organizations. Companies use PR professionals to help promote and communicate what is great and right and true about them. It has nothing to do with overshadowing negative stuff with bright-shiny-happy fluff. 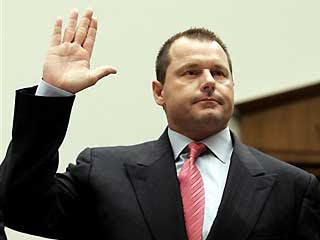 Clemens said during his testimony "No matter what we discuss here today, I am never going to have my name restored." Yep. Damage done. Your reputation is a precious thing...handle it with care.